The automotive industry in the Soviet Union spanned the history of the state from 1929 to 1991. It started with the establishment of large car manufacturing plants and reorganisation of the AMO Factory in Moscow in the late 1920s–early 1930s, during the first five-year plan, and continued until the Soviet Union’s dissolution in 1991. 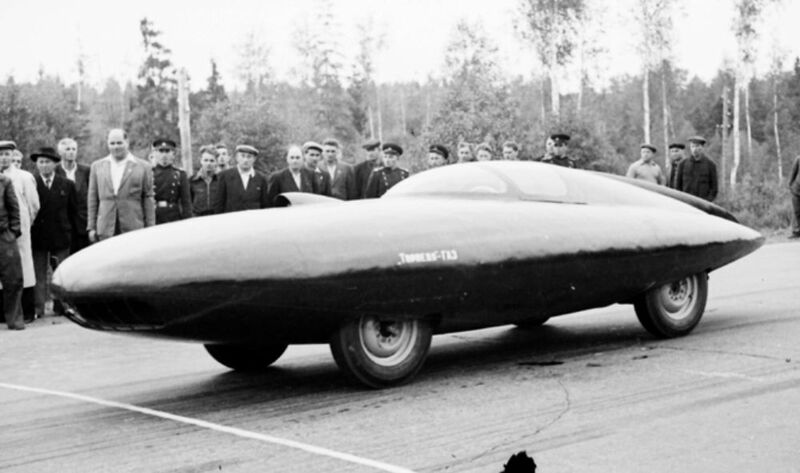 Below are 16 coolest, weirdest and fastest racing and concept cars which built in the USSR. Built in 1934. Only one GAZ-Aero was produced by engineer Aleksei Osipovich. Its based on GAZ-A. Body is wooden and covered with metal plates. Standard engine was improved with aluminum head and compression ratio was increased. The speed of this car was still no match to other sport cars. Engine: 4 cylinder gasoline, 3,285 liters, 48 hp @ 2300 rpm. Produced in 1938. 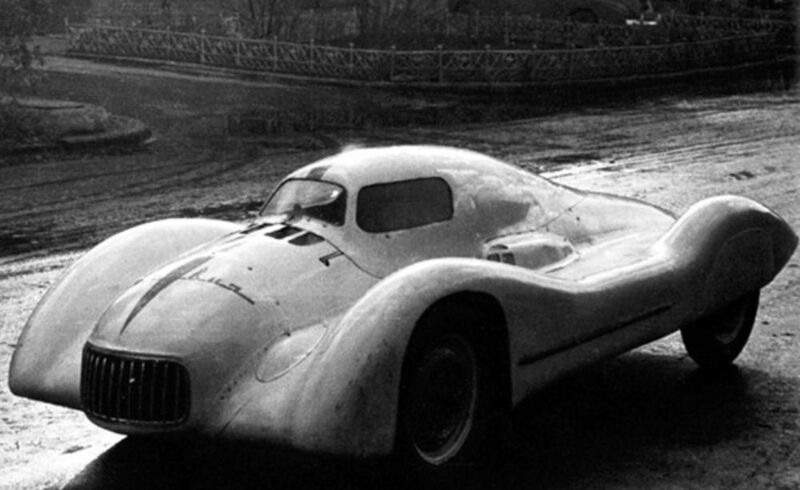 This GAZ-M1 based race car is he fastest Soviet race car before the war. Original GAZ-M1 engine was boosted to 65 hp instead of 50 hp. After some testing a new 6 cylinder 100 hp engine from GAZ-11 was installed and some details were redesigned (new wheel caps, dome abouve driver’s head, rounded grill plating). 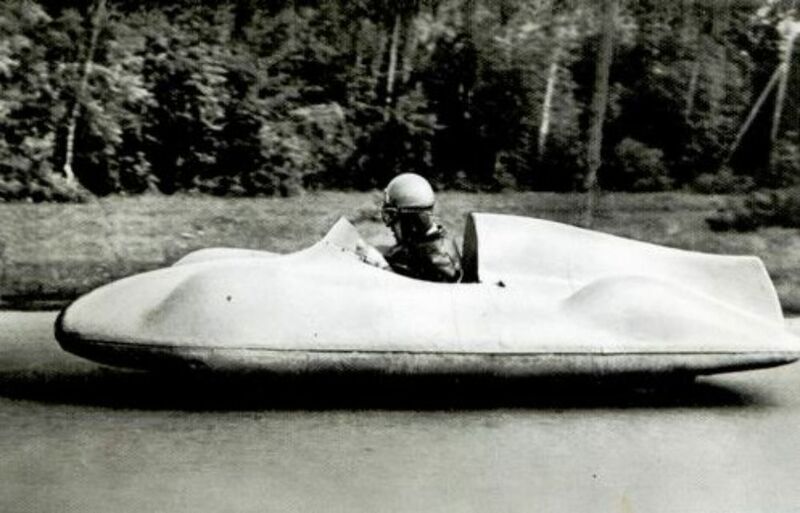 With original 65 hp engine the top speed was 148 km/h but when 100 hp engine was installed the top speed was 162 km/h! Sports car based on the production model GAZ-20 “Pobeda”. In 1951, three vehicles were equipped with rotary blowers “Rutz,” two carburetors replaced by one. Thus the maximum power increased to 105 hp, and speed – up to 190 km/h! 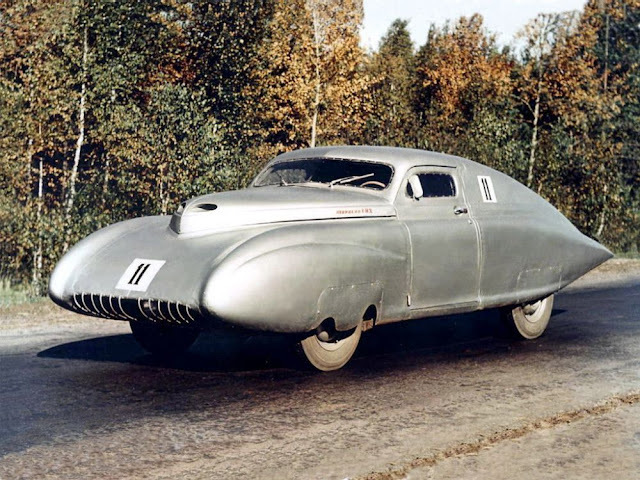 In 1951 Russian automaker ZIS debuted its first ZIS-112 Concept Car. 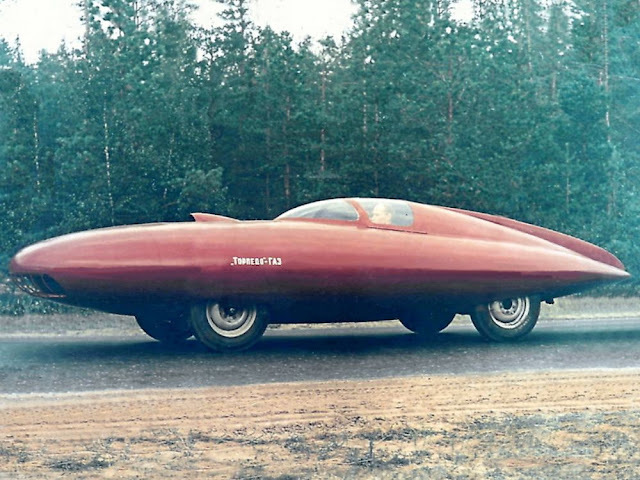 The car, known as the Cyclops, was designed by Valentine Rostkov. The two-seater prototype was heavily inspired by the 1951 GM LeSabre concept car. 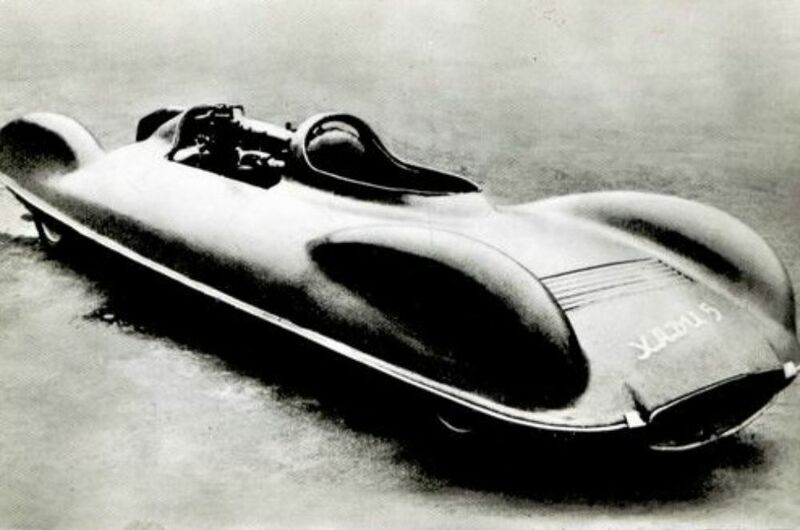 The car had a removable hard top, and was powered by 140 horsepower V-8 out of a ZIS-110. The car was later equipped by an 186 horsepower V-8 experimental engine with four carburetors. The car also featured an oil radiator and manual quick adjusting system for the ignition. Four-cylinder 2,4 l engine that produces 105hp at 4000 rpm. Maximum speed – 191 km/h. 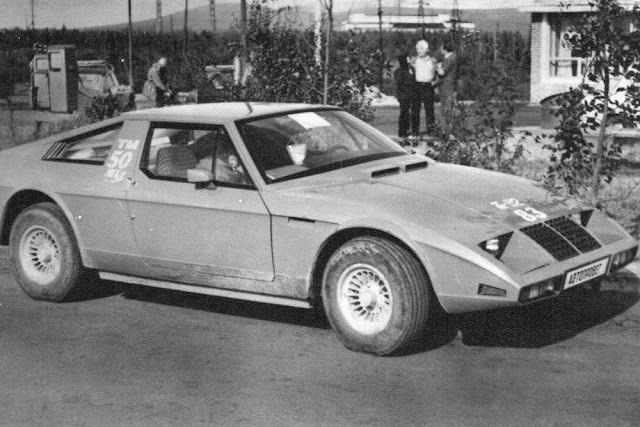 GAZ TR “Arrow”, with a jet engine. Settlement speed of the device had to make about 500 km/h, but due to the lack of specially prepared route and high-speed tires the maximum speed according to the program of test arrival should not have exceeded 300 km/h. Built in 1954. 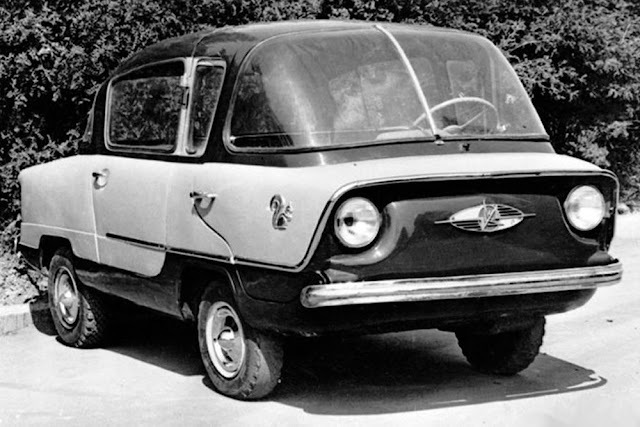 Back in the late 1940s, Yuri Dolmatovsky, brother of Soviet poet Yevgeny Dolmatovsky, pondered the pros of wagon-style design. It was his involvement that led to the development of the first Soviet passenger MPV. Alas, Dolmatovsky’s efforts, which found favorable reviews even in the pages of foreign automotive publications, failed to win support from above. Only a single prototype was made, and even that was scrapped in 1954. Seven years later, the Chevrolet Corvair Greenbrier appeared on the U.S., based on Dolmatovsky’s ideas. Moskvich-G2. A record-breaking racing car designed by I.A. Gladilin and I.I. Okunev, built in 1956. The Moskvitch G2 set three Soviet speed records in long-distance racing. 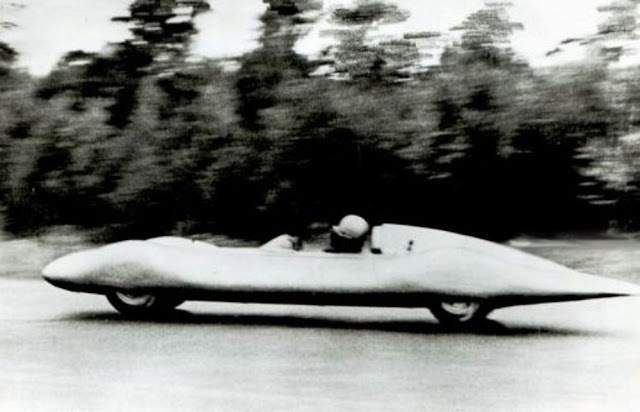 It competed in the 1959 USSR Championship and won in the under 2500cc class. 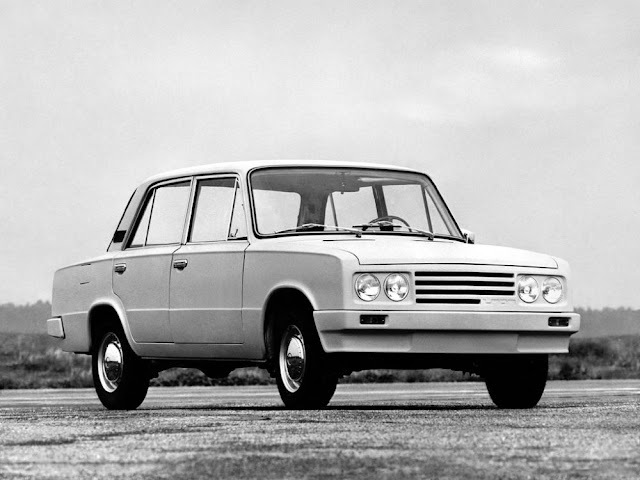 The Moskvitch G2 was no longer used after 1960 and written off in late 1963. Only two were built , and both were dismantled for spare parts. Engine capacity – 245 cm3, power – 54 hp at 7200 rev / min, gears – 4, length – 4.5 m, the curb mass – 420 kg, speed – 200 km/h. Zvezda 6 set up two world speed records. Independent suspension on all wheels. Cylinders – 4. Engine capacity – 3000 cm3, power – 126 hp at 4,500 rpm, gears – 3, length – 4,25 m, weight – 550 kg, speed – 290 km/h. Back in 1975, Porsche’s chairman Ernst Fuhrmann met with the Soviet automotive industry minister Viktor Polyakov and agreed on a three-year partnership where Porsche would help design Ladas. This is the failed result of that partnership. It’s called the VAZ-Porsche 2103 and it was planned to be a facelift of the Lada of the time. Porsche revised the suspension, redid the interior, and cleaned up the exterior. Well, they pulled off all the metal brightwork and put plastic in there instead. To put things charitably, it looks very much of its period. A homemade car conceived by engineer and car enthusiast Yuri Algebraistov in 1969, but assembled only in 1977. The machine was highly praised and won numerous awards at international exhibitions. However, it did not go into mass production. Only two were built, and one survives to this day. On the road since 1977, it has clocked up more than half a million kilometers. Another homemade sports design, it was the brainchild of engineer Alexander Kulygin, who also produced a six-wheel all-terrain vehicle and a concept car, both for the military. The Pangolina was built in 1980 and very successfully. 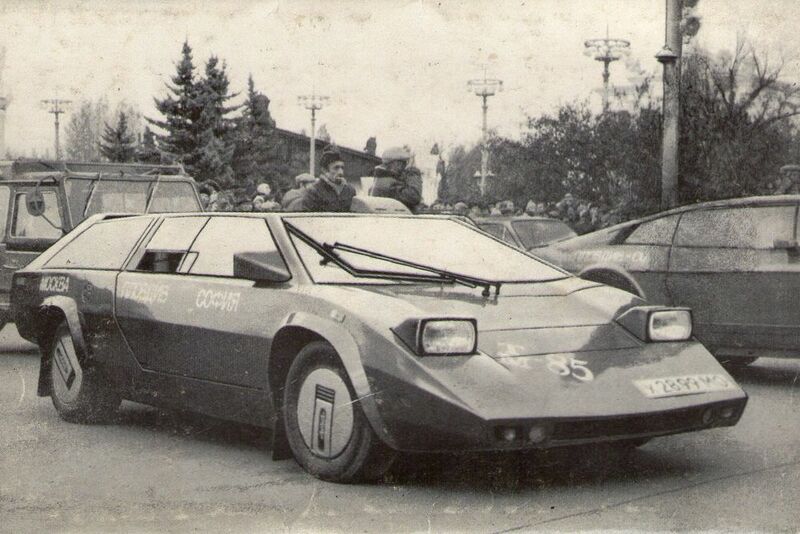 Together with its creator, it featured in various Soviet racing competitions and even visited the “EXPO 85” International Auto Exhibition in Plovdiv, Bulgaria. The car was used in Soviet pop clips. It is now in a museum. 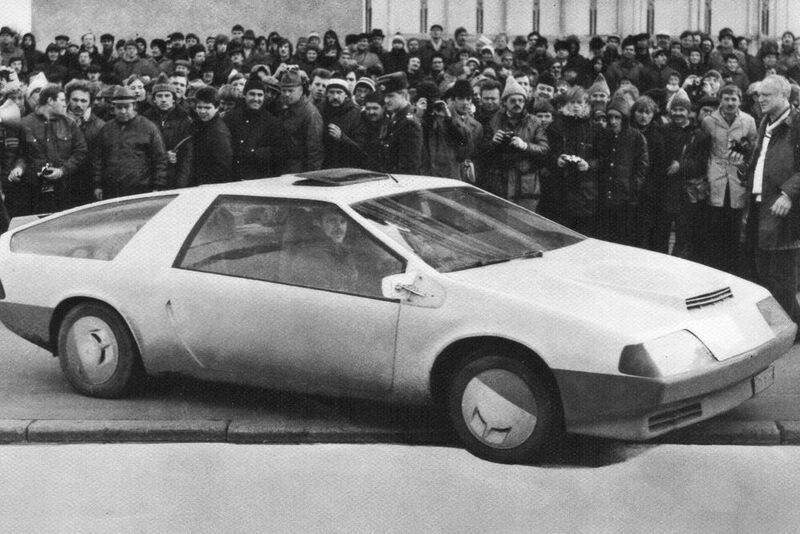 In January 1982, in a small workshop on the outskirts of Leningrad, two young men, Dmitry Parfenov and Gennady Hainov, decided to create a car of their own making. 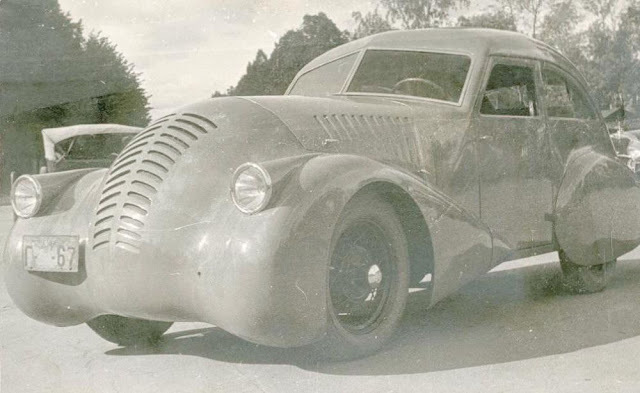 Interestingly, unlike the majority of home-made cars, it was built almost entirely without factory parts — even the engine was designed and hand-built by the two enthusiasts. The car was highly praised by then General Secretary of the Communist Party Mikhail Gorbachev and took part in numerous international exhibitions , but was never mass produced. 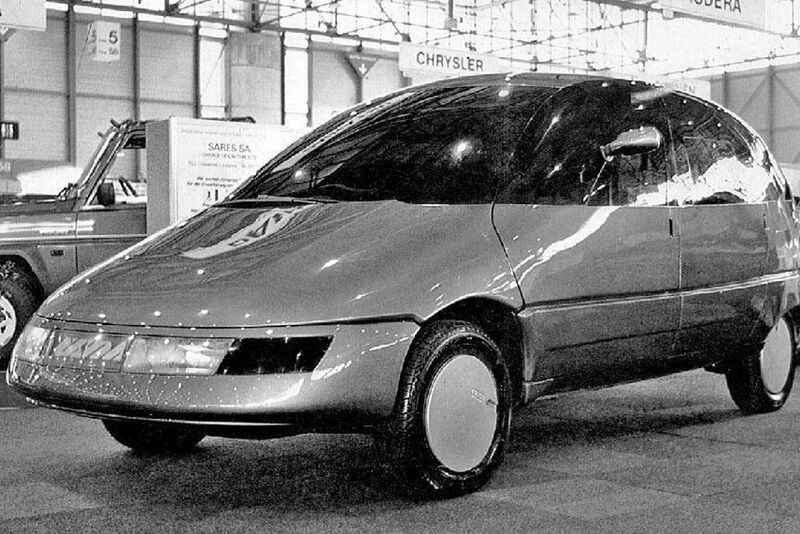 The Okhta automobile was built in 1986-87 at the Leningrad Laboratory of Advanced Prototyping of Light Vehicles by NAMI (the Central Automobile Research Institute). This concept car could seat a maximum of seven: the second and third seat rows were removable, while the front could be rotated through 180°. The rear seat folded into a handy table. 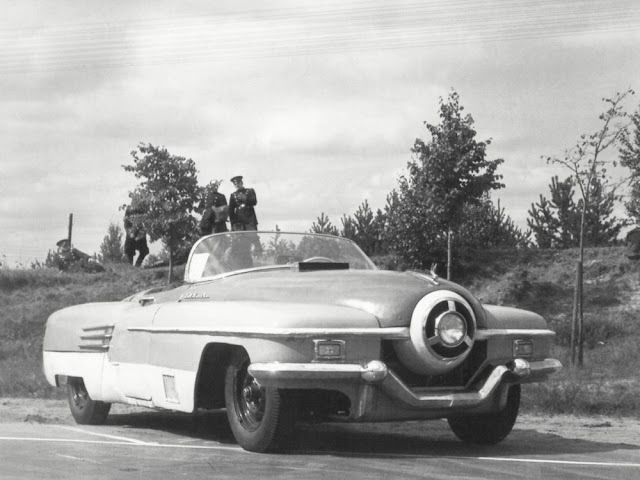 At that time, the multiplex system — in a Soviet car no less — was pure science fiction. The only instance, restored after a crash, is on display in a museum.